“So you’ve decided to grow an apple tree. Congratulations! We’re certain that you’ll find this expedition into the realm of horticulture both satisfying and rewarding, especially when you’re able to pluck the delicious and very literal fruits of your labor from your very own tree. Let’s get started with these six easy steps. Step one: Locate a good, sunny location to plant your sapling. Step two: Dig a three-foot wide hole at your chosen location. After you’ve buried the sapling’s roots, be sure to cover the dirt around the trunk with mulch to keep grass and weeds from growing too close. Step three: Give the sapling the equivalent of one to two inches of water a week for the next year, while—wait, what’s the long face for? Surely you weren’t expecting apples to blossom overnight! Okay, so growing an apple tree—or any fruit-bearing tree, for that matter—isn’t some weekend project. It’s a commitment that requires patience, dedication, and also, patience. But wouldn’t it be wonderful if there was a way to get that delicious fruit to show up on the limbs a little quicker? Enter grafting. The process of grafting has been floating around for at least a few thousand years and can endow fruit-bearing trees with some pretty impressive perks, not least of which being a sizeable reduction to the juvenile period. In other words, grafting means more fruit in less time. In horticulture, a graft is the union between two previously separate parts of plants. The first part, called the rootstock, is chosen because of its (you guessed it) roots. The other part, called the scion, is selected for what it produces—in this case, fruit. Using specialized cuts, the scion is wedged into the rootstock, where, over the course of several weeks, the graft eventually “takes” and the two separate parts begin functioning as one tree. The rootstock provides nutrients to the scion, which in turn produces fruit. 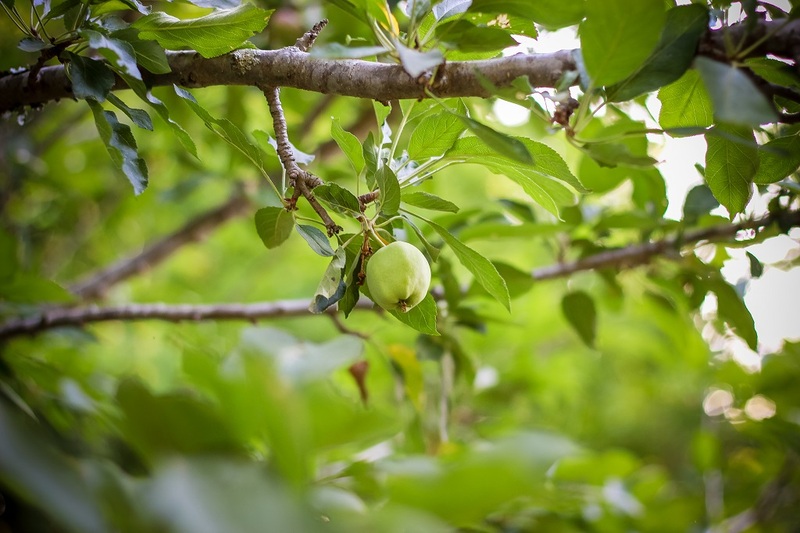 Grafting is extremely common in commercial orchards, where the graft of an apple tree scion onto a dwarf or semi-dwarf rootstock produces an apple tree that bears a greater quality and quantity of fruit close to the ground for easy plucking. It also gives the apple tree the cold resistance of its new root system, allowing it to grow in temperatures that would kill an ungrafted tree. Let’s hop trains for just a minute and talk about ancient Israel, which has about as little in common with horticulture as humanly possible—at least, at first glance. They blew it. Big time. And repeatedly. Hebrews 8:7-8 points out, in one of the Bible’s more polite understatements, that God found fault with the Israelites’ end of the covenant and ultimately revoked it, in favor of a new one. That new covenant is the one you and I entered into when we accepted Christ’s sacrifice through our repentance and baptism. It’s the one we remain under as we strive to keep God’s holy law, knowing that the blood of our elder Brother will allow us to get back up and continue on when we stumble. Which brings us to the apostle Paul, who reminds us that “some of the branches were broken off, and you, being a wild olive tree, were grafted in among them, and with them became a partaker of the root and fatness of the olive tree” (Romans 11:17). Did you get that? We’re scions, grafted onto the same Root that our Israelite forerunners grew from. The Root from which we draw strength and sustenance is none other than the God who led Israel. He nourishes us with His Holy Spirit—something we lacked in our natural state. It took being grafted from our “wild” root system into God’s to receive that gift. And now that we’re here, we don’t have to remain in our juvenile state. With God’s Spirit, our growth process is accelerated—we can begin to bear fruit. That fruit is none other than the fruit of that Spirit, as listed in Galatians: “But the fruit of the Spirit is love, joy, peace, longsuffering, kindness, goodness, faithfulness, gentleness, self-control” (Galatians 5:22). And the more we allow God’s Spirit to lead and direct us, the more of that fruit we can produce. We noted earlier that grafting an apple tree onto a “better” root system allowed for an increased and superior output of fruit. The same is no less true of us with God. On our own, it takes a great deal of time before we manage to produce fruit, and even that is of an inferior quality—supposing it’s worth mentioning at all. But grafted onto the Root, nourished by the very Spirit of God, we find ourselves capable of so much more that we ever were on our own. But all this doesn’t come without a sobering warning. Paul goes on to remind us, “You will say then, ‘Branches were broken off that I might be grafted in.’ Well said. Because of unbelief they were broken off, and you stand by faith. Do not be haughty, but fear. For if God did not spare the natural branches, He may not spare you either. Therefore consider the goodness and severity of God: on those who fell, severity; but toward you, goodness, if you continue in His goodness. Otherwise you also will be cut off” (Romans 11:19-22). We can make Israel’s downfall our own if we’re not careful. The Israelites saw what they were capable of with God, but forgot that such capability came from God. Paul warns that “you do not support the root, but the root supports you” (Romans 11:18). We were not entitled to be part of this tree, nor do we have some inherent right to remain on it. If we turn from God, He will break us off—from Himself, from His Spirit, and from all the good things we have in Him. May we all continue to grow into more Godly trees. This Sabbath Thoughts was originally posted on August 11, 2012 as a note on the Sabbath Thoughts Facebook page. 2 Responses to "Grafting In"
Nice job-that definitely adds a lot to the fruit analogy! Really like this one. So much analogy regarding two becoming ONE. Reminds me of John 17:20-21. Have a blessed Sabbath!